Forager Project: Support us with edible credits. Get more of your favorite food, when you pay us in advance. Your prepaid tab helps us, we can put the money to good use. Food matters—this is the core of everything we do. We express this belief through our ingredient choices because when it comes to making meaningful products, ingredients rule. Choosing ingredients for flavor, taste & nutrition means we deliver products that are nutrient dense, low in sugar and delicious. 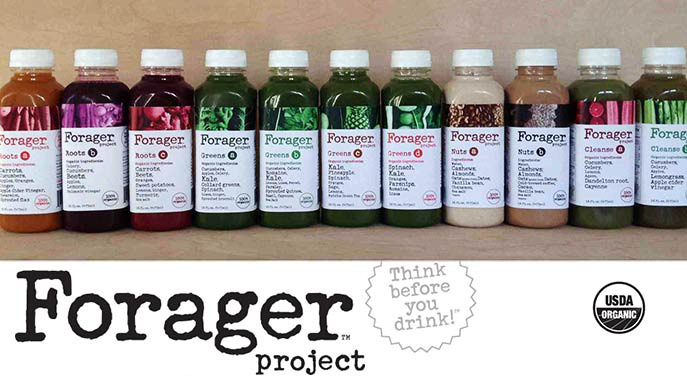 Forager products are convenient, 100% organic, cold-pressed and perfectly protected using HPP technology which makes them an ideal fast slow food. At the register, use the Credibles app on your smartphone to redeem your credits for Forager Project. Currently at Whole Foods Market in Northern California (complete list). Check if your store carries the products.